Dr. Rogers was born and raised in California. While obtaining her Bachelor’s degree in Graphic Design from California State University, Chico, she began working as a surgical technician for a plastic surgeon and then made the decision to pursue a career in medicine. After graduating from Saint Louis University School of Medicine with honors in research, Dr. Rogers completed her internship in internal medicine at California Pacific Medical Center in San Francisco. She then completed her dermatology residency at the University of Miami, where she was Chief Resident. Dr. Rogers is board certified by the American Board of Dermatology. She is a fellow of the American Academy of Dermatology and American Society for Mohs Surgery and is a member of the American Society for Dermatologic Surgery, Women’s Dermatologic Society and Skin Cancer Foundation. 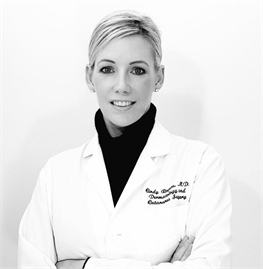 Dr. Rogers is a voluntary clinical instructor in the Department of Dermatology at the University of Miami School of Medicine and the Miami VA Medical Center.